Saturday night’s UFC 223 card will feature a very important fight, as former strawweight title challenger Karolina Kowalkiewicz hopes to build on her most recent win over Jodie Esquibel and move one step closer to another shot at the championship. Standing across from her in the Octagon will be mixed martial arts veteran, once beaten UFC strawweight, and subject of this article Felice Herrig, who after a decisive loss to Paige VanZant, has rattled off four consecutive wins over ascending levels of fighters. With one more win Herrig hopes to stamp her ticket to a number one contender fight at worst or a title fight at best. Today I am going to take a look at this matchup and discuss the things Herrig must do and avoid doing to fight her way to victory. Karolina Kowalkiewicz is a high activity fighter in both her movement and her volume. She likes to move all over the cage, then come crashing in with a variety of strikes that put her opponent on the defensive, allowing her to score points, deter them from firing back, and strike her way into clinches. She sets the table for all this with her jab, which she uses to create clean entries, control her opponents’ ability to initiate offense, and work her offense overall. The same would work in the favor of Herrig, as a consistent, busy, and varied jab would be able to limit, if not neutralize, Kowalkiewicz’s jab. This would impair her entries and allow Herrig to work her way into position to strike without reaching or rushing, as well as set the table for the rest of Herrig’s offense. In fights against Heather Jo Clark and Rose Namajunas, a smart and active jab disrupted Kowalkiewicz’s pressure, adversely affected her accuracy, and provided her opponents with clear lanes of entry and exit against her. 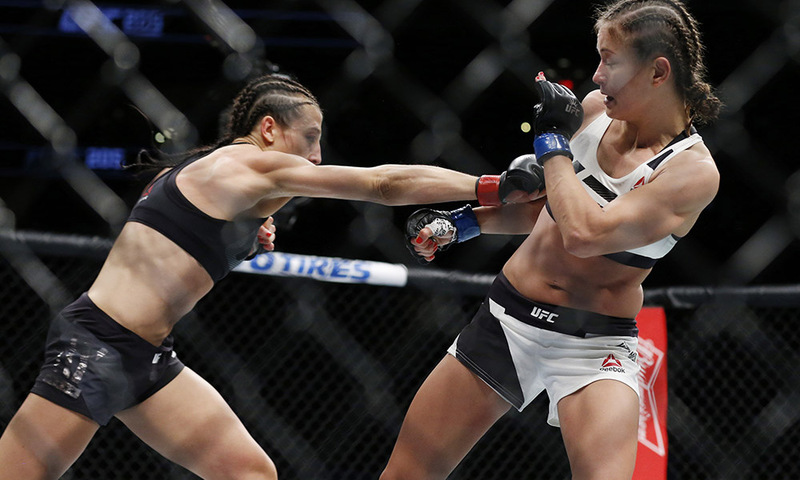 When opponents didn’t use the jab, their ability to control exchanges or get away from her volume lessened greatly, as was shown in fights with Esquibel and Randa Markos. 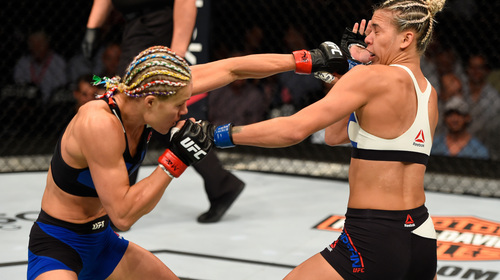 On Herrig's end, her unwillingness to establish and consistently use a jab against VanZant hurt her ability to control pace and to dictate where and when exchanges took place. Kowalkiewicz is a better version of VanZant in that regard, and she can repeat the feat in a much more savage manner. Kowalkiewicz’s whole game is built around momentum -- getting position on her opponents and then overwhelming them with a variety of strikes. The best way to deal with her momentum is to not let her get started, which means striking with her and striking in combination. Striking with her will disrupt her timing and forward pressure, striking in combination will put her on the defensive and make it harder for her to exit and reset. Throwing singular power strikes or singular quick strikes won’t dissuade Kowalkiewicz or slow her because she is willing to take one or two to get off four, five, or six strikes. The effectiveness of this was highlighted in fights with Claudia Gadelha and Joanna Jedrzejczyk. As effective as Karolina Kowalkiewicz has been on the feet, she has been equally ineffective and inconsistent on the ground; to limit some of her pressure and create some lanes to land strikes, Herrig is going to have to work takedowns. They will act as a line of defense against her volume and variety of strikes and afford Herrig opportunities to get her hands on Kowalkiewicz and extend her in grappling exchanges, which will exhaust her. It will also allow Herrig to put Kowalkiewicz on the defensive, get her to the fence, and chain takedowns or get her own strikes off, much like she did against Cortney Casey, or like Kowalkiewicz experienced at the hands of Gadelha. If and when she gets Kowalkiewicz down, Herrig should make sure to engage in extended grappling exchanges at every opportunity; she has a huge advantage in regards to technical, strategic, and situational awareness on the the ground. Whether ultimately getting the submission or just riding for control, piling up strikes, and forcing Kowalkiewicz to constantly defend, Herrig will be winning the fight, dictating its pace, and creating a sense of hesitancy in Kowalkiewicz while striking or pressuring on the feet. This is similar to what Herrig did when she fought Justine Kish, and what Gadelha and Marcos did when they fought Kowalkiewicz. Unlike many fighters in her division, Karolina Kowalkiewicz has an effective and busy clinch; much of her success comes from the fact that she aggressively pursues clinches. Most of her opponents are so determined to avoid clinches that they spend an inordinate amount of energy trying to stay away from her. They get put on the defensive, limiting their ability to get off offensively, and they also allow her to control when and where they engage. To take this away from her, you have to be willing to initiate clinches that challenge her in her area of strength and make her work so that she doesn’t feel like she is in a safety zone where she won’t have to fight. Takedowns and control are important, and it is very hard to get either if you are being reactionary. Namajunas learned this in her fight with Kowalkiewicz, as her refusal to initiate clinches on her terms allowed Kowalkiewicz to outwork her and overwhelm her with a tidal wave of punches, knees, and elbows. It also hindered Namajunas’ ability to attempt meaningful takedowns or put strikes together, as she was concerned about being dragged into the clinch and dominated again. Gadelha took a different approach, initiating and scoring in the clinch early, disrupting Kowalkiewicz’s pressure, making her defensive, and allowing her to get her to the fence, get the takedown, and finish. Kowalkiewicz moves around a lot, so you can’t be static or lazy with your footwork. Doing so will allow her to outposition you, which will enhance the damage she does when she moves forward and starts stringing combinations together as she attacks. One way to prevent that is to keep repositioning, as it keeps Kowalkiewicz from getting the entry point she wants. Another is to counter her linear attacks, getting off the centerline and forcing her to turn and reset. This can be done by employing strikes that counter or interrupt her pressure like Jedrzejczyk and Namajunas did, or by getting into clinches or scoring takedowns like Gadelha did. This should open up opportunities for Herrig to get her own offense going. A second benefit of constantly turning an opponent is it keeps her from sitting down on her punches taking away the power of her strikes and the number of strikes used. 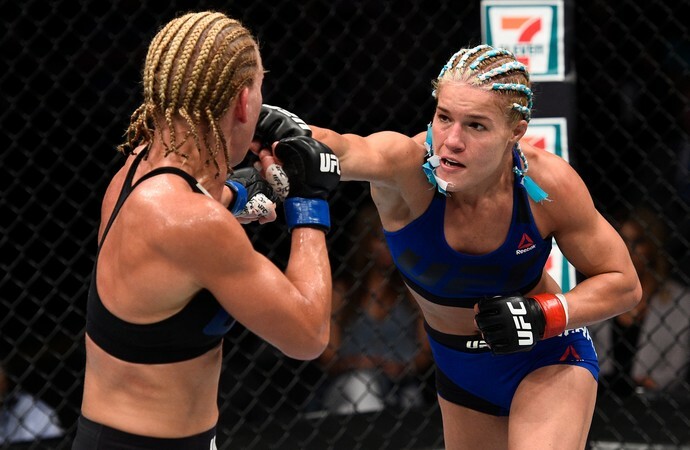 Against VanZant, Herrig was stationary and gave her every opportunity to force a pace and physically impose her will on Herrig, who had all the skills and ability necessary to slow or control the pace with smart kickboxing and veteran seasoning. Against Kowalkiewicz, can't be a station target. Against fighters who build their games around volume, movement, and variety, the worst thing you can do is become predictable. Once they have figured out what you want to do and how you want to do it, they will be free to attack with impunity. The best way for Herrig to limit Kowalkiewicz's ability to attack freely and aggressively is to mix things up. Sometimes she needs to lead, others she needs to counter. Sometimes she will need to exchange, other times she will need to stick and move. In other situations she will need to use takedowns or initiate clinches. As long as Kowalkiewicz has to think about what’s coming, her effectiveness falls off. She isn’t a dynamic athlete, nor is she a devastating striker. Her success is built around the idea that she can attack opponents at multiple levels on the feet, consistently making them work to get away from her pressure or fight for position to avoid being overrun with it. 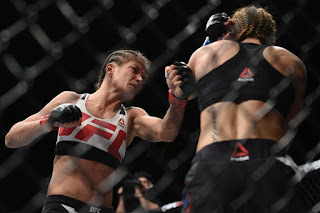 Kowalkiewicz turns fighters one-dimensional and then imposes her will on them, like she did against Namajunas, Esquibel, and Clark, all who started off being busy and creative, but eventually ended the fight fairly predictable and on the defensive. Herrig is a seasoned veteran who has faced every caliber, every body type, and every style of fighter. She has all the width and depth of skills necessary to slow a fight and limit the opportunities for Kowalkiewicz to impose her will and dictate the pace, place, and tone of the fight, so Herrig needs to use them. In her two losses, Kowalkiewicz could never really get going because Gadelha and Jedrzejczyk attacked her at multiple ranges, in multiple ways, and on multiple fronts. And in Herrig's last loss she allowed herself to be overwhelmed and pushed to fight at a higher pace by a less skilled and seasoned fighter in Paige VanZant; if she becomes predictable or fights dumb it will happen again. Next Saturday night at UFC 223 we will see one of two things: Karolina Kowalkiewicz will show that she has grown and is ready to become truly elite and challenge for a title due to her accomplishments and technical/strategic development. 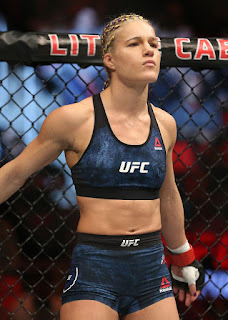 Or the longtime veteran in Felice Herrig, who has been unable to break through in regards to her actual fighting skills and in-cage accomplishments, will finally ascend into the position of elite fighter in more than popularity and notoriety. Herrig has shown she can beat the rest of the division, it’s time to see if she can beat one of the best.